Wisk broth water and cornstarch in small saucepan until cornstarch is completely dissolved. Add the teriyaki sauce, ginger, garlic powder, honey and pepper to taste. Wisk to combine. Cook mixture on medium - low heat whisking constantly until it comes to a boil and thickens. Remove from heat and cover. In large saut? pan heat oil over high heat. Add the carrots and mushrooms and stir fry 2 minutes. Add the snow peas and water chestnuts and stir fry about 1 min more. Add chicken and stir fry one minute more. Add the warm sauce and toss to coat and heat through. 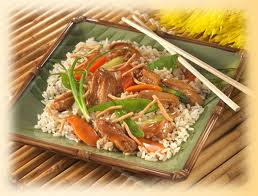 The teriyaki stir fry is ready to serve..enjoy it !